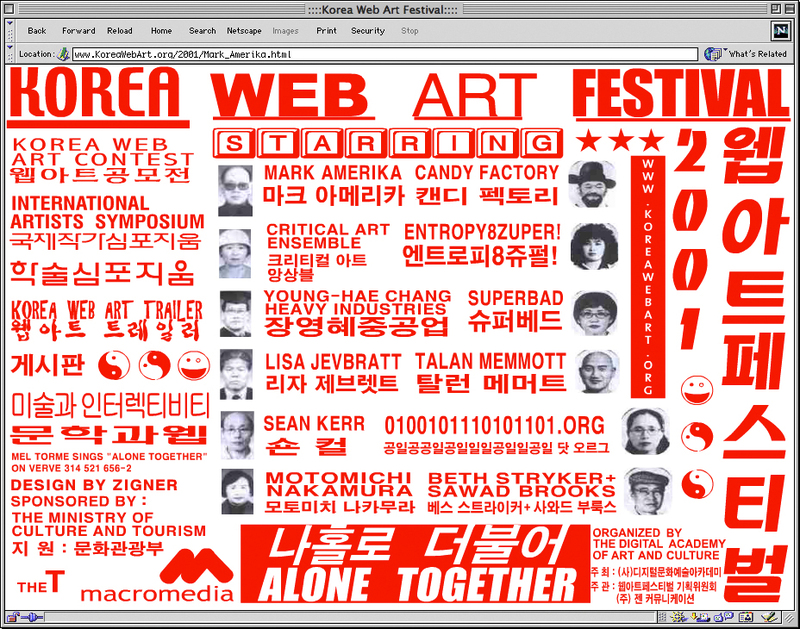 The Korea Web Art Festival commissioned us a new work. We did a secret performance instead. Nobody, including the curator, knew our plans. The opening night we connected to the exhibition website and switched the names of the artworks with one another. None of the works was modified. Whoever visited the exhibition, instead of seeing the chosen artwork, would get imperceptibly redirected to a different one. The modified version was visible for few hours. We were fascinated by the idea of performing online, but unfortunately the action had catastrophic consequences. The Korean Ministry of Culture took the drastic decision to lay off the curator and cancel the festival, and some of the artists felt deceived. A heated debate erupted, touching on ownership, the potential of online art, censorship and identity. For what we are concerned, this was our last “pure Net Art” piece. Total failure. It’s seem to me that hacking a site in 2001 is pretty old news. — to craft work which creates meaningful commentary. which they did not intend. For myself, I’m thrilled to remain hopelessly un-hip … a happy fuddy duddy. Actually, they only copied it to their own server. > biennial…]..i think they r italian from memory? > fine.ly exe.cuted & quite obvious ][iconically][……. Is there anything wrong with wanting my work to be seen as intended…? before he erased Wilhem’s drawing. But those were more civilized times. hack art, drag and drop art. ps haven’t visited the site now or during its auto-re-configuring state. property in such a way. to the server, they could have easily fixed it. Besides: What is net art about if not playing with each others data? have been really destructive here). on this list who are so infuriated about the 01 intervention. 220 kiri1 Microsoft FTP Service (Version 5.0). 331 Password required for 0100101110101101org. 230 User 0100101110101101org logged in. 257 “/artist” is current directory.